THE STORY - For Detective Harry Hole, the death of a young woman during the first snowfall of winter feels like anything but a routine homicide. His investigation leads him to "The Snowman Killer," an elusive sociopath who continuously taunts Hole with cat-and-mouse games. As the vicious murders continue, Harry teams up with a brilliant recruit to try and lure the madman out of the shadows before he can strike again. THE GOOD - Occasional pretty imagery. 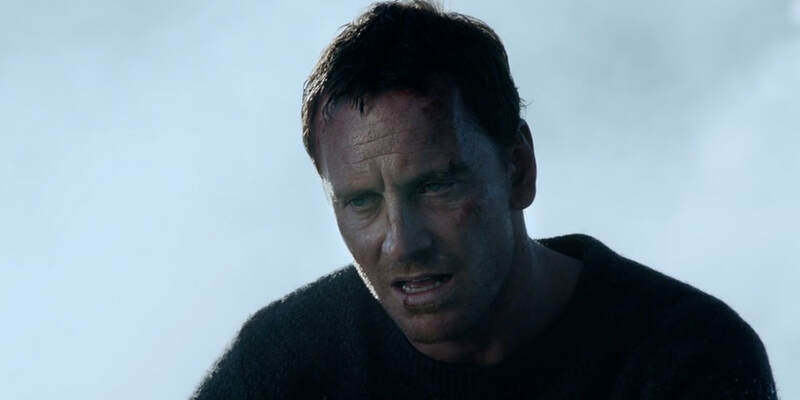 Fassbender is always fun to watch even in such a disappointing film. THE BAD - Due to Alfredson's comments on how they were not able to shoot the entire script, it certainly shows on screen as the story never finds its footing and the editing is lackluster. ​"Mister police, I gave you all the clues." Wait wait wait, stop right there Mr. Snowman killer. Before you give “mister police” anymore clues I have some things to say. Tomas Alfredson’s “The Snowman” is a crime thriller film that apparently missed the memo of the thrilling aspect. Adapted from the novel of the same name by Jo Nesbø, Alfredson’s latest project cannot seem to find its footing. With a sloppy narrative and just overall poor execution, “The Snowman” isn’t 2017’s worst film as some are saying but it is quite lousy. Surrounding the drunken and regretful detective Harry Hole (Michael Fassbender), “The Snowman” tells the sloppy story of a vicious serial killer in Oslo, Norway. When a woman named Birte Becker (Genevieve O’Reilly) goes missing the Oslo police are taken on a game of cat and mouse with the infamous murderer simply known as The Snowman. Detective Harry Hole and recent transfer Detective Katrine Bratt (Rebecca Ferguson) begin a hunt for the identity of the murderer when things go, cold (Bad pun, I know). The story for this film is told in such a mismanaged manner, it’s quite upsetting. Tomas Alfredson is a hell of a director as proven by "Let The Right One In" and "Tinker, Tailor, Soldier, Spy" but this project just falls flat on its face. The story bounces from location to location that it’s difficult to keep up with its pace. As if the constant shifting in physical backgrounds isn’t confusing enough, the convoluted detective story just adds to the already miscalculated approach. There is hardly ever any investigating or discovery in this film. It’s more so people talking to each other, a lot of looking around houses and snowy mountains, and then a few murders thrown in here and there. However, our two main detectives hardly ever do any sort of detective work. They just receive phone calls from time to time that gives away the locations of certain people and a lot of the information they receive comes from the other police station workers. So everything that is discovered about the murders rarely comes from our two main characters. There is a small sequence where Detective Hole discovers why Detective Bratt is interested in this case. Without giving away too many spoilers he learns that this specific case has a really personal connection with Detective Bratt. Of course, once Hole learns this he is forced to suspend her. But the fifteen-minute sequence of Hole digging into Bratt's past is probably the only bit of detective work you will see in this film. It’s kind of hard to have a compelling cop drama when the cops don’t really do cop things and the drama doesn’t feel real. Which leads into my next point, the film is completely hollow in terms of emotions. Almost all of the characters seem to have some sort of emotional tie to this case but those emotional ties are never fully explored. We get brief flashbacks into Bratt’s emotional connection with the case but they arrive so abruptly and unwarranted that it feels more out of place than anything else. Instead of fully diving into the emotional turmoil The Snowman killer has caused Bratt, we just get these brief flashbacks that are actually unintentionally funny. The flashbacks literally come out of nowhere, they will just randomly start happening and the content of said flashbacks is just pointless information. Sure we may get these brief glimpses into Bratt’s backstory but the content is so poorly executed, we as an audience don’t have a care in the world. For example, we’ll see Bratt’s father investigating a case that also involved The Snowman killer. He is researching into some details about a previous murder but this flashback comes so abruptly it doesn’t fit within the story. And the performance from Val Kilmer is awkward and audio dubbed so it makes the flashbacks even more embarrassing. Another disappointing element to the film is how lackluster the actual filmmaking is. Sure the cinematography is really nice in certain spots but a lot of the camera movements are completely unmotivated. The camera will start tilting, panning, dollying, etc. just so the film gives off the illusion of sophistication. Whenever the camera is moving it does not serve a purpose in the scene. It is simply moving because someone on set said "Hey, we have too many static shots. Let's do some sort of movement." The editing is also not executed well either. Not only can the film not decide what pace it wants to be told at but there are a lot of continuity errors, especially within the very first scene of the film. The first scene is just a simple dialogue scene that is edited together almost like a fight. The shots happen so quickly for the first couple minutes it's incredibly offsetting. Not only do the cuts come so quickly but there is no logical reason for them to come at that speed. It is literally just shots of a kitchen, some small details in the kitchen, and then the characters in the kitchen. But for the first two minutes of said scene, all of the cuts happen at this rapid pace. The film cannot decide what it wants to be from the moment it begins and still has no sense of identity in its closing moments. Tomas Alfredson's "The Snowman" is not "The Room" level bad, as some have made it seem, but it is quite close and surely disappointing considering Alfredson's track record. From the sloppy storytelling to the overall lackluster execution in filmmaking, Alfredson has landed his first bad film. He has stated that they did not end up shooting quite a bit of what was in the script and I would like to believe if they had, the film would be much better. I won't say "The Snowman" is the worst film of 2017 but it is certainly one of the worst.